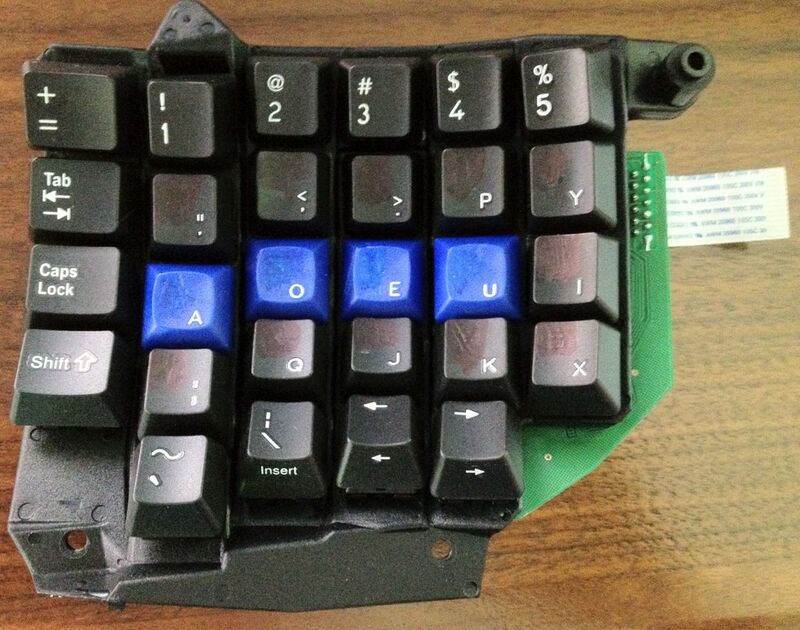 My keyboard before any modifications. First I unscrewed the six screws from the bottom and opened it up. 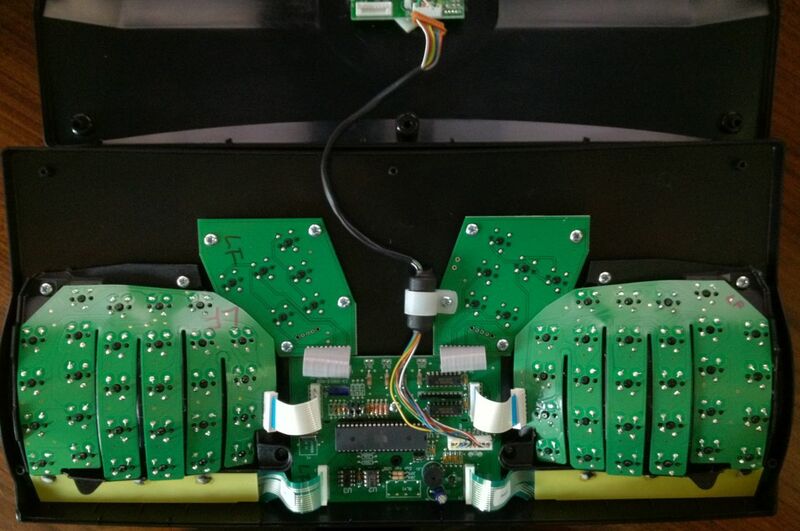 Then I unscrewed each the left and right key wells and slid the white connector up to release the ribbon cable from the main circuit board. 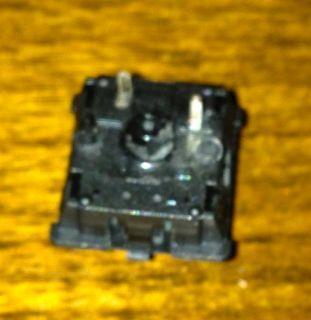 Next I cut a hole in the black plastic to make room for the new key. I used a drill to make a hole and then a Dremel to widen it. 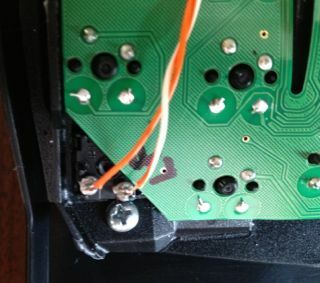 I was careful not to damage the circuit board. It’s like they left that space there for this purpose. I kept trying to put the new key into the hole until it fit. 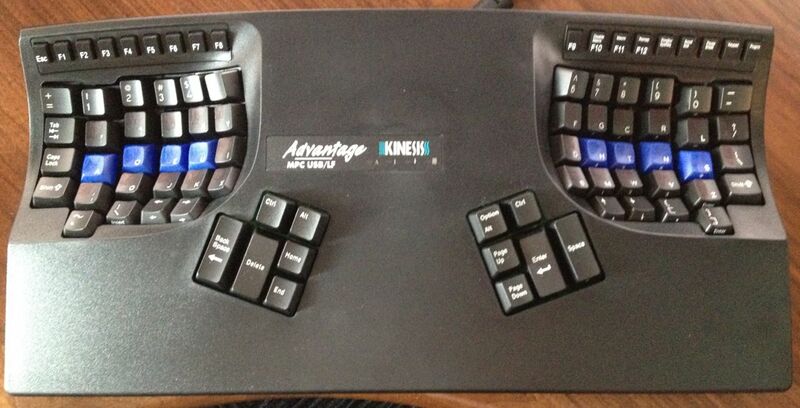 I got the two shift keycaps and keyswitches from Kinesis, so it would match the keyboard exactly, and they cost me $1 each for a package of 15 keys. You’ll note that I opened up the keyswitches and removed the unneeded resister. When they fit nicely and the keyswitches were rotated so the posts were sticking to the side of circuit board, I soldered some cat-5 wire to them. Next I jammed both the blue and orange wires into the main circuit board at the GND plug, and just taped the wires to the black GND wire. 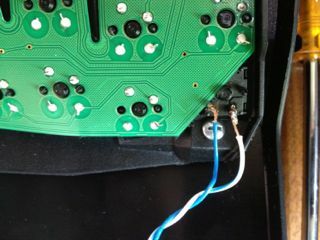 If I was really clever, I’d solder the blue and orange wires together so they make a nice plug. 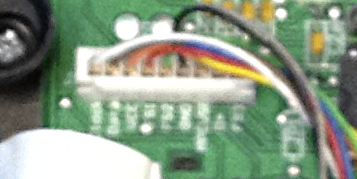 I jammed the blue-white and orange-white wires into the FS2 plug, taping it to the green FS2 wire. 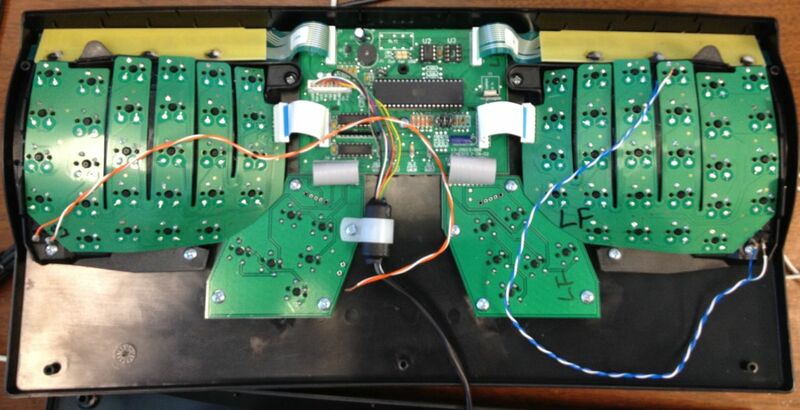 This makes those keys into the main foot pedal action, which is the Keypad shift. I could have jammed one into FS1 and one into FS2, but I like them both to do the same thing. 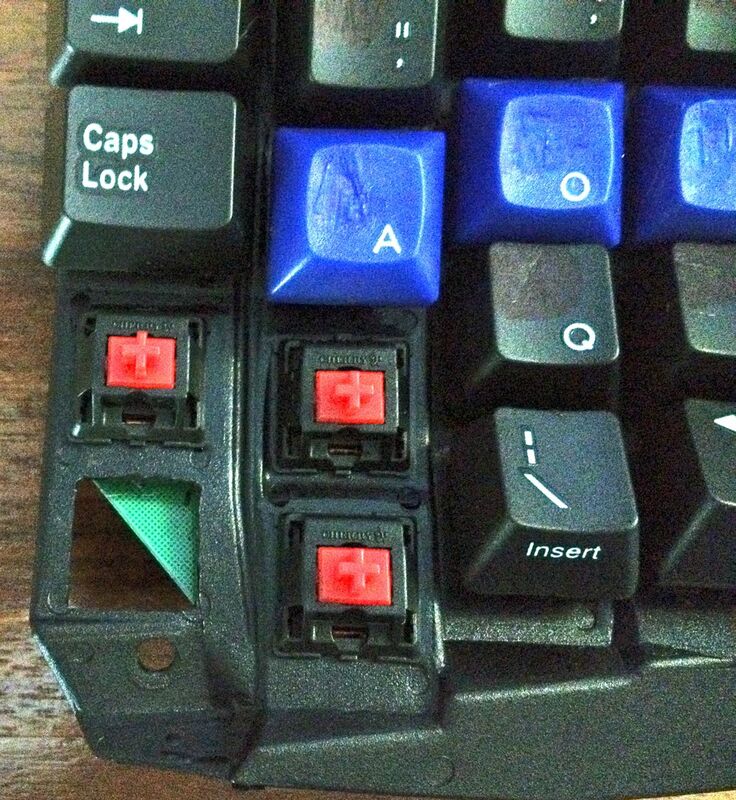 I cut the case, again with the Dremel, to accommodate the new keys and then closed up the keyboard. It’s easy to test the new keys, because they make the keypad led light up when pressed. The spot between the keyboard wells is a great place for my iPhone, so I have a USB plug snaking out from below the keyboard and my headphone plug snaking out from above it. You may also want to see the picture of my desk and its eight monitors. 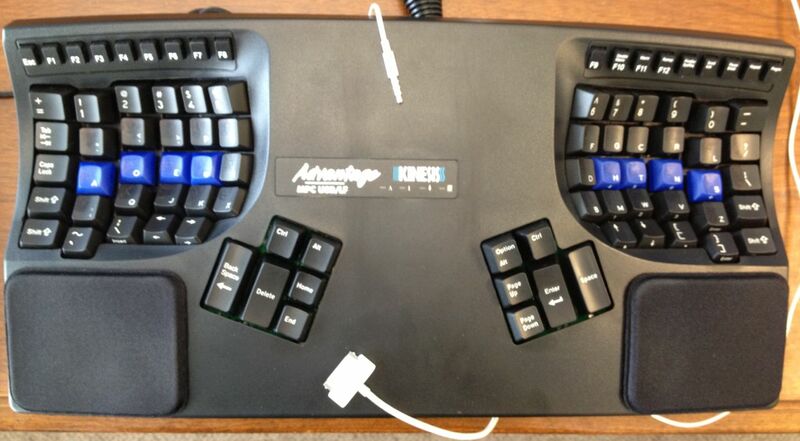 Sordna wrote a great article about how he added these two keys and then went on to add eight keys in total. He’s a big fan of adding wrist keys and recommends them in particular.